ClientEarth, Icelandic UK, Waitrose, Marks and Spencer, Young’s, BirdsEye Iglo, and FishFight founded the Sustainable Seafood Coalition in 2011. We have since grown significantly, representing all sectors of the UK seafood supply chain. ClientEarth is the secretariat of the SSC, and is responsible for the administration and coordination of the SSC. This includes facilitating SSC meetings, publishing SSC codes and other materials, and communications to members. We hold members’ meetings several times a year. Members’ priorities and topics brought forward for discussion define our agenda, and align with our aims. Where more detailed member engagement is required, we form working groups to reach preliminary decisions, and then seek agreement from the full group. We invite relevant experts to these meetings to provide technical advice. 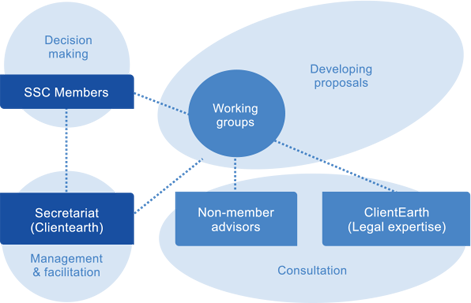 The diagram below outlines the typical decision-making process for the SSC. Membership fees provide the SSC’s main funding stream, allowing for an independent secretariat function. Private foundations contribute the remainder of the secetariat costs.